There’s this joke among us Jewish folks that Hanukkah is always either too early or too late… so when on earth is it ever on time? This year the holiday is so early in December that we’ve barely finished our Thanksgiving leftovers, yet I’m already preparing to make potato latkes for our family Hanukkah party this weekend. Yum! My kids have pulled out our menorahs (including the ones we’ve all made at school over the years! ), played with our entire dreidel collection, and are already trying to pull the chocolate gelt down from the tippy-top of our pantry. The countdown has officially begun! Whatever you celebrate this December, whether you’ll be lighting your own menorah for eight nights or teaching your kids about the holiday at home or in school, Happily Ever Elephants has compiled a list of our very favorite Hanukkah books for kids of all ages. These books celebrate the brave Maccabees who stood up to King Antiochus’ huge army and fought for the right to practice their religion and study their Torah. The books also celebrate the miracle that occurred when the Maccabees took back their temple, and the tiny amount of oil they had kept the menorah lit for eight whole nights, giving them enough time to find more oil for the temple’s eternal flame. So gather your dreidels, eat some gelt, and settle in with these special books about the Festival of Lights. Happy Hanukkah to all! Without further ado, here are our favorite Hanukkah stories, beginning with books for your youngest readers, and gradually progressing to our older ones. Enjoy! Dreidel, Dreidel, Dreidel, illustrated by Amy Cartwright: Dreidel, dreidel, dreidel, I made you out of clay… Your young kids will be mesmerized by this adorable little board that brings the famous dreidel song to life. The cute illustrations and pop up detail at the end will have your children totally enchanted. The spinning dreidel makes their eyes widen with joy, and I guarantee it — when you read this book with tiny tots, they will make you feel like the greatest showman in the world! 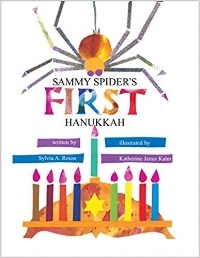 Sammy Spider’s First Hanukkah, by Sylvia Rouss and illustrated by Katherine Janus Kahn: This is a wonderful Hanukkah book for your toddlers, a part of the Sammy Spider series that helps the youngest readers learn about the Jewish holidays. In this installment, Sammy Spider looks on as the Shapiro family lights the menorah and spins brightly colored dreidels to celebrate the festival of lights. Sammy longs for a dreidel of his own, but his mother continuously reminds him “Spiders don’t spin dreidels. Spiders spin webs!” My littlest students adore Sammy Spider! 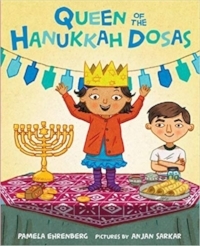 Queen of the Hanukkah Dosas, by Pamela Ehrenberg and illustrated by Anjan Sarkar: Move over latkes, hello dosas! We adore this book about one young boy with a multicultural family - an Indian mom and a Jewish dad, to be exact. So as Hanukkah approaches and the family gets ready to celebrate, Indian traditions and foods are woven into the lively narrative. Any book that embraces a unity of culture and practices is a winner in our world! Maccabee! 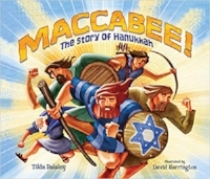 : The Story of Hanukkah by Tilda Balsley and illustrated by David Harrington: Judah and his team of super-hero like Maccabees fight to free Jerusalem from the cruel King Antiochus in this rhythmic, rhyming story that is perfect for reading aloud. The book tells of the miraculous oil that lasted for eight days and the Maccabee’s determination to stand up for what they believed in, making this a perfect read to share with little ones curious about the real story behind the holiday. Hanukkah Bear, by Eric Kimmel and illustrated by Mike Wohnoutka: This story never disappoints and is one of my absolute favorite Hanukkah tales. A retelling of The Hanukkah Guest, Hanukkah Bear tells of an old woman, nearly blind and deaf, who is known throughout her village for her fabulous latkes. When Hanukkah arrives, the woman invites the rabbi to dinner to celebrate Hanukkah and feast on latkes, but the aroma from her kitchen awakens an old bear who arrives at her home before the rabbi. Due to her poor vision and eyesight, the story never fails to elicit giggles as the old lady mistakes the bear’s furry coat and happy growls for the rabbi’s beard and blessings. Meet the Latkes, by Alan Silberberg: Lucy Latke comes from a family of — you guessed it — latkes! And these potato pancakes are a little wacky. So when Grandpa Latke tells the story of Hanukkah to the family, complete with mighty Mega-bees who battle evil alien potatoes, things get a little off the rails. Laugh out loud funny for those looking for a creative and fun take on the Hanukkah story! 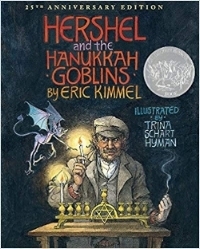 Hershel and the Hanukkah Goblins, by Eric Kimmel and illustrated by Trina Schart Hyman: We love this story of clever Hershel who outwits the goblins that repeatedly attempt to ruin Hanukkah for everyone in a small village. How does he do so? With pickles and eggs and dreidels, of course! This a unique adaptation of the ancient Hanukkah story, reminding all that miracles can happen even when the odds seem stacked against you. Chanukah Lights, by Michael Rosen and Robert Sabuda: This is a stunner of a pop-up book, following the Festival of Lights through place and time as the Jewish people search for a land to call home. For each of eight nights, the menorah is pictured in a different scene, and the intricate pop-up designs on each page are sure to thrill little readers. The Dreidel that Wouldn’t Spin: A Toyshop Tale of Hanukkah, by Martha Seif Simpson and illustrated by Durga Yael Bernhard: Oh, how I love this wonderful spin on Hanukkah miracles! What happens when a peddler gifts a toy-shop owner an exquisite dreidel? The owner sells it at a hefty-price. But the wealthy purchaser and his daughter are distraught that the dreidel doesn’t spin, so they demand their money back. On and on it goes, with each spoiled customer returning the defective dreidel, until a poor man and his son enter the shop, content to simply peruse all the wonderful toys. And so it is that these two, the only patrons carrying the true spirit of Hanukkah within their hearts, are able to witness the small miracle of the dazzling dreidel. Oskar and the Eight Blessings, by Tanya Simon and Richard Simon, and illustrated by Mark Siegel: A young refugee arrives in New York City on the seventh night of Hanukkah, after escaping the horrors of Kristallnacht and World War II. In his pocket? A photograph and the address of an aunt he has never met. As Oskar wanders through the city in search of his new home, he encounters many of the city’s residents who offer him small acts of kindness, reminding him of his father’s words: “You have to look for the blessings.” A true, timeless beauty. The Latke Who Couldn’t Stop Screaming: A Christmas Story, by Lemony Snicket and illustrated by Lisa Brown: Oh my goodness. The first time I read this to my students, they were in hysterics, laughing so hard some of them literally had tears streaming down their faces. This zany story, written by THE Lemony Snicket, begins with the birth of a potato latke that starts screaming the moment it hits the frying pan. And then? The latke takes off… and tries to explain the miracle of Hanukkah to flashing Christmas lights, candy canes, and a Christmas tree. Love, love, love. Celebrate Hanukkah with Light, Latkes and Dreidels, by Deborah Heiligman: This stunning book does what National Geographic does best - it pairs gorgeous photographs and smart text to teach readers about the history and significance of Hanukkah, and it illustrates how Hanukkah is celebrated around the world - from Israel to India to Ghana. With discussions ranging from lighting the menorah, to the traditional foods eaten during the festival, to the spinning dreidels, this is a wonderful, factual introduction to this festive holiday. Nine Spoons: A Chanukah Story, by Marci Stillerman and illustrated by Perren Gerber and Pesach Gerber: This is my very favorite Hanukkah book to read with my upper elementary students. Nine Spoons is set in a Nazi concentration camp, and it tells the story of a group of young women in one of the barracks who search for nine spoons. Why? So they can make a menorah for the children in their barracks and celebrate Hanukkah in secret. Utensils were a rarity in the camps, and the celebration of a Jewish holiday was literally done at the risk of death. Based on a true story, this book is a phenomenal testament to the importance of fighting for the freedom to practice your religion and keeping meaningful traditions alive even amidst the most unthinkable horrors. 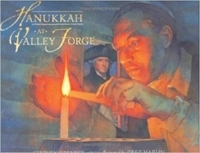 Hanukkah at Valley Forge, by Stephen Krensky and illustrated by Greg Harlin: During the American Revolution, George Washington sees a soldier lighting the Hanukkah candles and murmuring a prayer. The soldier then tells Washington all about Hanukkah and the Maccabee’s triumph against the oppressive King Antiochus and his strong army. Washington finds inspiration in the soldier’s story, even drawing some parallels between the Hanukkah story and the American fight for independence. A wonderful complement to any classroom learning about the Revolution. Happy Hanukkah, friends! And if you are looking for our list of holiday books including books about Christmas and Kwanzaa, make sure to click here! I love the holiday season, when the joy bubbling within festive homes spills out front doors and floods the streets outside. I love the smell of fir trees and fireplaces mingling in the air, colorful lights shimmering from roof tops and menorahs big and small glimmering from window sills. There’s no doubt about it - the atmosphere in December is practically electric, tinged with hope and positivity. Kindness abounds, neighbors are merry, and the festive spirit soothes even the toughest of days. Though my childhood has long since passed, I still feel an extra skip in my step after Thanksgiving, knowing my family will soon light the menorah, stuff ourselves with latkes, and gather at friends’ homes to decorate their majestic Christmas trees with ornaments of silver and gold. I’ve always found it magical to think that people worldwide spend the month of December preparing to celebrate, and then celebrating their own meaningful holidays, whether it’s Christmas or Hanukkah or Kwanzaa. Even more meaningful is the fact that I live in a community so open to learning about all religious and cultural traditions. No matter what you believe, holiday celebrations are our families’ steadfast foundations, infusing our lives with meaning, purpose, and love. Though we celebrate Hanukkah, I truly enjoy exposing my boys to the traditions so significant to our friends and neighbors. And what better way to learn about the holiday season than with fabulous picture books we can share with our children? Here are some of our very favorite stories that celebrate the rich and meaningful holidays that bring such joy to our lives in December. Happy Holidays, friends! 1) A World of Cookies for Santa, by M.E. Furman and illustrated by Susan Gal: This fabulous book came out last year and details the varied ways in which children worldwide prepare themselves for Santa’s arrival. Santa doesn’t get milk and cookies in India. Instead, kids leave Christmas Baba (Father Christmas) a crispy fried treat called a kulkuls, together with a cup of spicy chai. And in South Africa, Kersvader arrives by donkey and children leave him hertzog cookies filled with apricot jam and topped with coconut meringue. Yum! This is a fascinating look at how Christmas is celebrated across the globe, filled with gorgeous illustrations to boot. Definitely a new favorite! 2) Hershel and the Hanukkah Goblins, by Eric Kimmel and illustrated by Trina Schart Hyman: We love this story of clever Hershel who outwits the goblins that repeatedly attempt to ruin Hanukkah for everyone in a small village. How does he do so? With pickles and eggs and dreidels, of course! This a unique and creative adaptation of the ancient Hanukkah story in which the Syrians prohibited the Jews from worshiping as they desired, reminding all that miracles can happen even when the odds seem stacked against you. 3) The Broken Ornament, by Tony DiTerlizzi: More! More! More! Isn’t that what we all hear our children say all the time? Jack constantly wants more of everything, so when he breaks his mom’s old Christmas ornament, he doesn’t understand why she is so upset. Can’t they just buy more ornaments? Turns out, that dusty old ornament was his mother’s treasured heirloom, and Jack has much to learn about the true meaning of the holiday and Christmas spirit. 4) Chanukah Lights, by Michael Rosen and Robert Sabuda: This is a stunner of a pop-up book, following the Festival of Lights through place and time as the Jewish people search for a land to call home. For each of eight nights, the menorah is pictured in a different scene, and the intricate designs on each page are sure to thrill little readers. Equally gorgeous? Robert Sabuda’s The Christmas Story — another pop-up that captures the wonder of Christmas and the Nativity on every exquisite page. 5) The Polar Express, by Chris Van Allsburg: You can’t celebrate Christmas without this marvelous classic, the story of a young boy who is welcomed aboard the Polar Express on Christmas Eve, right at a time he begins to question Santa’s existence. The boy’s magical journey to the North Pole reminds us that being a believer will keep us young at heart, and even as we age, the spirit of Christmas can continue to enchant. 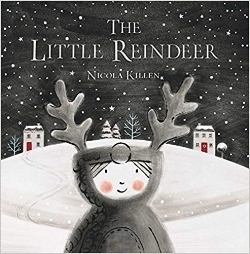 6) The Little Reindeer, by Nicola Killen: Oh how I adore the illustrations in this book! This is one of those quiet, understated stories that breathes magic on every page. The story tells of a friendship between a little girl and a lost reindeer, and a Christmas eve the two will never forget. It’s a simple, sweet, and wondrous tale – complete with die cut pages and metallic ink – sure to become an enthralling family favorite. 7) Room for a Little One: A Christmas Tale, by Martin Waddell and illustrated by Jason Cockcroft: This is a gorgeously illustrated book that tells the story of all the animals sharing the manger — animals who are typically foes but instead rest together in harmony. At the end, Joseph and Mary arrive and Mary gives birth to Jesus, who is welcomed by all. A heartwarming and simple story that celebrates Jesus’s arrival in a manner even toddlers can understand. 8) Meet the Latkes, by Alan Silberberg: Lucy Latke comes from a family of — you guessed it — latkes! And these potato pancakes are a little wacky. So when Grandpa Latke tells the story of Hanukkah to the family, complete with mighty Mega-bees who battle evil alien potatoes, things get a little off the rails. Laugh out loud funny for those looking for a creative and fun take on the Hanukkah story! 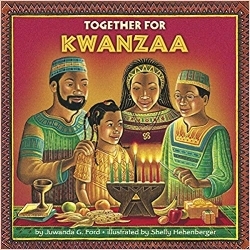 9) Together for Kwanzaa, by Juwanda G, Ford and illustrated by Shelly Hehenberger: Kayla loves celebrating Kwanzaa every year, but when her brother is trapped at school due to a snowstorm, Kayla fears Khari will miss their family celebrations completely. This is a lovely story that introduces young readers to the practices and traditions that make Kwanzaa a special December holiday. 10) Hanukkah Bear, by Eric Kimmel and illustrated by Mike Wohnoutka: This story never disappoints and is one of my absolute favorite Hanukkah tales. A retelling of The Hanukkah Guest, Hanukkah Bear tells of an old woman, nearly blind and deaf, who is known throughout her village for her fabulous latkes. When Hanukkah arrives, the woman invites the rabbi to dinner to celebrate Hanukkah and feast on latkes, but the aroma from her kitchen awakens an old bear who arrives at her home before the rabbi. Due to her failing eyes and ears, the story never fails to elicit giggles as the old lady mistakes the bear’s furry coat and happy growls for the rabbi’s beard and blessings. 11) Maccabee! : The Story of Hanukkah by Tilda Balsley and illustrated by David Harrington: Judah and his team of super-hero like Macabees fight to free Jerusalem from the cruel King Antiochus in this rhythmic, rhyming story that is perfect for reading aloud. The book tells of the miraculous oil that lasted for eight days and the Macabee’s determination to stand up for what they believed in, making this a perfect read to share with little ones curious about the real story behind the holiday. 12) Li’l Rabbit’s Kwanzaa by Donna L. Washington and illustrated by Shane Evans: When Li’l Rabbit’s grandma falls ill and is forced to miss out on the Kwanzaa feast, he seeks to find something else for his Grandma to enjoy. This story perfectly captures and celebrates several of the principles of Kwanzaa and illuminates the true meaning of the holiday – working together to help others. 13) The Dreidel that Wouldn’t Spin: A Toyshop Tale of Hanukkah, by Martha Seif Simpson and illustrated by Durga Yael Bernhard: Oh, how I love this wonderful spin on Hanukkah miracles! What happens when a peddler gifts a toy-shop owner an exquisite dreidel? The owner sells it at a hefty-price, of course. But the wealthy purchaser and his daughter are distraught that the dreidel doesn’t spin, so they demand their money back. On and on it goes, with each spoiled customer returning the defective dreidel, until a poor man and his son enter the shop, content to simply peruse all the wonderful toys. And so it is that these two, the only patrons carrying the true spirit of Hanukkah within their hearts, are able to witness the small miracle of the dazzling dreidel. 14) The 12 Sleighs of Christmas, by Sherri Duskey Rinker and illustrated by Jake Parker: If your kids love Goodnight, Goodnight Construction Site, don’t walk, but run out to buy them The 12 Sleighs of Christmas. When Santa’s elves discover Santa’s sleigh is totaled just before Christmas, the elves split into a dozen teams and set out to build Santa Claus a cool new sleigh — and Santa himself will decide which one to use for his special day. A fun new read aloud that will have kids marveling at the coolest sleighs imaginable, inspired by big rigs, motorcycles and zeppelins, too! And make sure to check out their newest Christmas themed read, Construction Site on Christmas Night! Another gem! 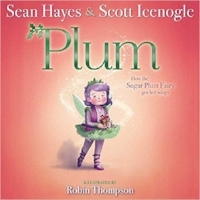 15) Plum: How the Sugar Plum Fairy Got Her Wings: by Sean Hayes & Scott Icenogle, illustrated by Robin Thompson: Did you ever wonder how the Nutcracker’s Sugar Plum Fairy got her wings? Look no further than Plum, an utterly charming new story about one orphan whose sweet and pure heart earns her the most unexpected rewards. A sweet book featuring magic, fairies, and even two kings. What a joy! What are your favorite holiday books? Let us know on our Facebook page! And don’t forget — if you liked this page, we think you will love these too: Favorite Books About Hanukkah, Favorite Books About Gratitude, Favorite Books About Love. I am thankful for mommy, daddy, my brother and Daniel Tiger. Yep. That about nailed the things my sweet boy loved and needed more than anything else in the world: his mommy for snuggles, his daddy for safety, his brother for laughter, and Daniel Tiger to teach him, well, pretty much everything. I can’t bear to take his picture off the pantry door where I taped it nearly two years ago. To me, this simple, sweet list is perfection. As my son grows, I know his “thankful” list will morph and change, but I want to continually remind him that the things we should be most grateful for are our relationships and the necessities, not the materialistic objects that clutter up our lives, blinding our eyes with the fastest and shiniest games and gadgets. I would like to use this November to go even beyond that. I aim to model an attitude of gratitude for my children, in which we continually express our appreciation for the things we are so lucky to have while simultaneously reminding them that others are not so fortunate— and wouldn’t it be wonderful if we could find a way to help? I know I’m not alone in seeking a way to encourage my boys to have grateful hearts all year round and not simply when Thanksgiving approaches. I’m confident that if I can instill a feeling of gratitude in my kids at these impressionable ages, the more likely they will be inspired to help those who may not be able to help themselves. This is what I hope for more than anything. Of course, I want my children to become intelligent young men. But if they grow up to be compassionate, grateful and directed by a strong moral compass that encourages them to give back to their community, whenever possible, I will feel like I have succeeded as their mom. Below are some of my favorite books to get both my students and my own children talking about the things for which they are thankful. But, perhaps more importantly, this list includes stories that can serve as “window” books— books that remind us that the things we take for granted are missing from many homes around the country. So many people face daily challenges while simply trying to provide for their families, and as thankful as we may be for what we have, we need these stories to open our children’s eyes to the struggles challenging the community around them and the myriad ways that they can give back. It’s a good reminder for us grown-ups as well. Enjoy these stories, and happy Thanksgiving! 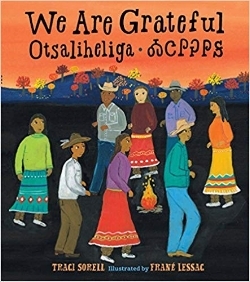 We are Grateful: Ostaliheliga, by Traci Sorell and illustrated by Frane Lessac: What a fabulous new book on gratitude, set in a vibrant Cherokee community. This “own voices” picture book travels through the seasons, giving readers a glimpse of the Native American community at rest and play. The word “ostaliheliga” is used by the members of the Cherokee Nation to express gratitude and is sprinkled throughout the pages. We simply LOVE this one! 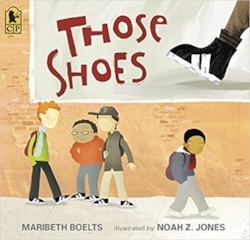 Those Shoes, by Maribeth Boelts and illustrated by Noah Jones: Jeremy wants nothing more than the same pair of shoes that the rest of the kids at school wear. But, according to his grandma, Jeremy’s “wants” are not nearly as important as his “needs.” This is such a special story, one I read to my students every year around Thanksgiving because it masterfully sparks a discussion about wants and needs, as well as the fulfillment that can be found in helping others. 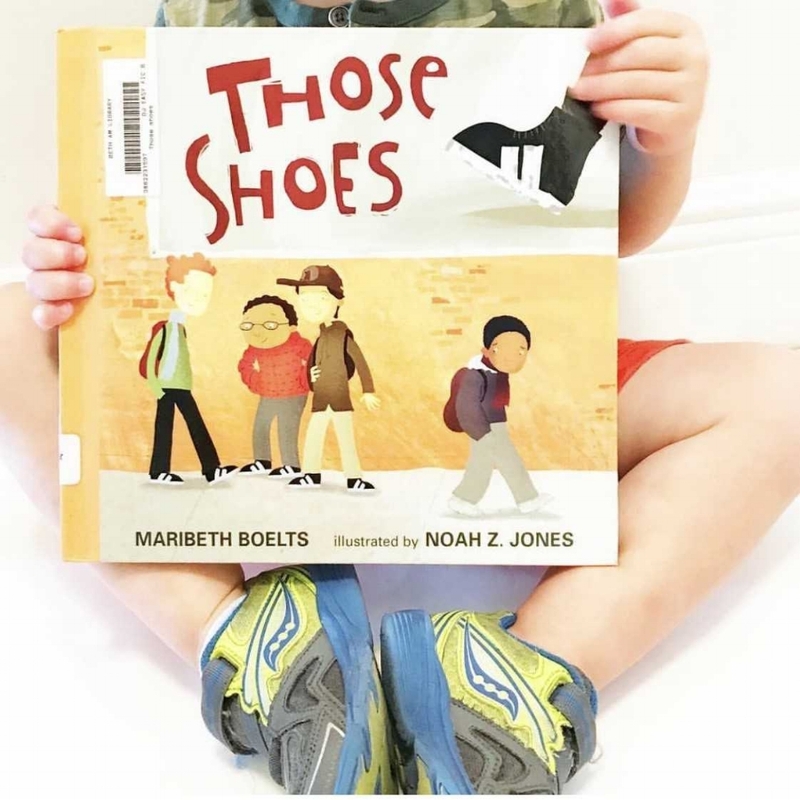 For our full review of Those Shoes, CLICK HERE! Maddi’s Fridge, by Lois Brandt and illustrated by Vin Vogel: This sweet story provides an important look at childhood hunger in a manner so readily understandable for young kids. I always read this with my elementary students, and it prompts great discussions not just about how important it is to help others in need, but also how to handle a situation when a friend makes you promise to keep a secret that causes you to worry about his or her well-being. Thank you, Omu!, by Oge Mora: A stunning debut! Everyone in the neighborhood follows the delicious scent of stew to Omu’s doorstep, where Omu (meaning “queen” in the Igbo language of the author’s parents) dishes her meal out with love. But when it comes time for Omu to sit down for dinner, she realizes she left no stew for herself! This is a gorgeous, timeless story of generosity and community, beautifully conveying that one good deed deserves another — and sharing is everything. 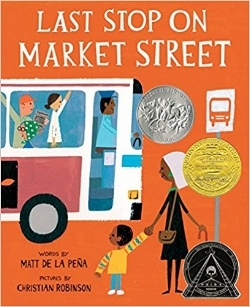 Last Stop on Market Street, by Matt de la Pena and illustrated by Christian Robinson: As a boy and his grandmother ride the bus one afternoon, the child continually asks his grandma about various luxuries they don’t have. His grandmother helps open the boy’s eyes to all of the ways in which they are rich, even though they may not have certain gadgets and gizmos. When their bus ride ends, the reader learns the two are going to volunteer at a soup kitchen. A surprise ending to a marvelous, remarkable book. 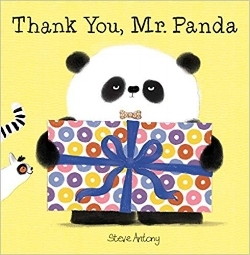 Thank You, Mr. Panda, by Steve Antony: I can’t get enough of this series of books. They are pure perfection when talking about manners with little kids, and this one, Thank You, Mr. Panda, shows us how we can graciously accept gifts even if they aren’t quite what we were hoping for. This is such a great story to help children understand that the simple act of being given a present is something to be thankful for, even if the present itself may not be our favorite. All the World, by Liz Garton Scanlon and illustrated by Marla Frazee: This gorgeous book showcases the glorious wonders of life, from the world’s oceans to our human bodies, from sweet music to the earth’s bountiful harvest. The illustrations are breathtaking and the sentiment is spot on, giving us a gentle reminder of the many gifts our world continues to offer. We have so much to be thankful for! Secret of Saying Thanks, by Douglas Wood, illustrated by Greg Shed: “The heart that gives thanks is a happy one, for we cannot feel thankful and unhappy at the same time. The more we say thanks, the more we find to be thankful for. And the more we find to be thankful for, the happier we become.” Need I say more? The Thankful Book by Todd Parr: This is such a perfect book to read with toddlers and young children! The Thankful Book, with its vibrant, childlike illustrations, encourages kids to recognize the everyday things in their lives for which they should be grateful. 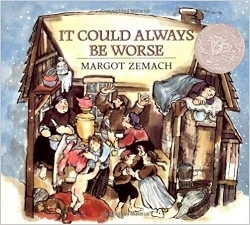 It Could Always Be Worse, by Margot Zemach: I just adore this Yiddish folk tale, the story of an unfortunate man who lived with his mother, six kids and his wife in a one bedroom hut. When the man seeks advice from a wise rabbi because the home is crowded and the family is bickering, the rabbi tells the man on several different occasions to bring his animals into the hut– first his chickens, then his goat, then his cow. When the man eventually tells the rabbi he can’t take it anymore, the rabbi tells him to let all the animals back outside. What ensues? The man ends up exactly where he started – but now he is so grateful for the serenity! Spoon, by Amy Krouse Rosenthal and illustrated by Scott Magoon: Sometimes it is hard to recognize how much we have to be thankful for when it comes to ourselves and our abilities, especially when you watch your friends with envy and marvel at the things they do so well that you just can’t do at all. This sweet story reminds us to celebrate our differences and to be grateful for everything that makes us special as individuals. A Chair for My Mother, by Vera M. Williams: After their home is a destroyed by a fire, Rosa and her family save coins in a big jar. What are they saving up for? A big, comfortable chair so the family can relax after their respective long days. This story is poignant and so beautifully conveys one spirited family’s will to persevere after a tragedy as well as the gratitude they display to those around them, even when their own losses were devastating. The Thank You Book, by Mo Willems: Who better to teach young kids about gratitude than our dear friends Elephant and Piggie? Join the two animals in the last book of this hit series as they go on a thank-o-rama and show their appreciation for everyone who helped make their stories a hit. If your little ones love Piggie and Gerald like my kids and students, this is one not to miss. For our full review of The Thank You Book, CLICK HERE! Which of these books about gratitude are your favorites? Make sure to let us know on our Facebook page! And guess what? If you found this list of picture books about gratitude to be helpful, we think you will love checking out these picture book lists too: Favorite Picture Books About the Holidays, Favorite Picture Books About Love, Favorite Picture Books About Hanukkah. Want me to be flat out honest with you? I’ve always hated Valentine’s Day. I hated walking around school as a teenager, with lanky legs and frizzy hair and a mouth full of braces, while the so-called “pretty” girls were practically human flower shops, complete with pink and red heart balloons blowing in the air atop bouquets of roses and carnations. I’ve always hated that there’s a holiday forcing us to say I love you, when it really should be said to those we care about every day. But now, thanks to Carter Higgins and Lucy Ruth Cummins' new book, This is Not a Valentine, I kinda fell in love with it. Because this book... oh man. This book is everything. This is Not a Valentine is such a tender story of a little boy navigating his first crush. It’s not about the trite things kids (or adults, for that matter!) think they should give someone to show their love- but instead those precious, unique things children do that, when viewed through a little one's eyes, become magical and meaningful. And, oh, the denial! That sweet, innocent denial, when kids try so hard to vocalize how they don't feel — but their actions tell the entire world a wholly different story! This heartfelt book is so accessible to children, illustrating that love is composed of those tiny actions we take to show someone we care about how much they brighten our world. This is Not a Valentine is such a sweet exploration of the childlike ways kids may show their admiration for one another - and the thing that makes it extraordinarily special is the beautiful manner in which it coveys how meaningful it is to give others the little things we know will make them the happiest. This is Not a Valentine is picture book perfection, in every sense of the word. In short? It exudes love and tenderness, hands down. Two trunks up for this gem! Want the book? Get it here! 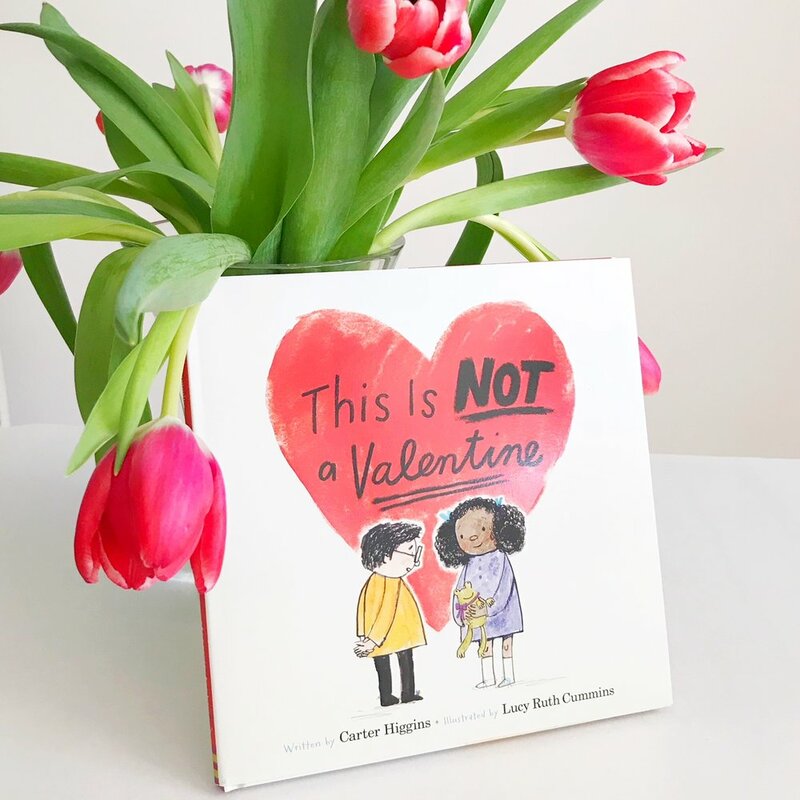 This is Not a Valentine, by Carter Higgins. HEE received an advanced copy of this book from the publisher, but all opinions expressed herein are our own. It's almost #FathersDay! And what better way for your kids to celebrate their love for their dads then with some phenomenal new books? I didn't even post for Father's Day last year because I truly was at a loss for favorite picture books to share. But this year I am so excited to suggest two new releases that I just adore. If you like poetry, we are loving My Daddy Rules the World, with poems both written and illustrated by Hope Anita Smith. At once tender, funny and powerful, this poetry collection is a sentimental celebration of fathers by a Coretta Scott King honor winning poet. If you also love sweet stories about the lengths a dad will go to to protect his child, then you must check out Daddy Long Legs, written by Nadine Brun-Cosme and illustrated by Aurelia Guillerey. Reminiscent of The Runaway Bunny, a particular favorite of mine from childhood, Daddy Long Legs is a French import that describes one father's valiant efforts to assuage his son's concerns about the challenges that might prevent dad from picking him up at kindergarten. It melts my heart with each and every read, and we love it's whimsical illustrations, too. These are the perfect two books for your child to give Dad on Father's Day, and we hope you love them as much as our family does! Want the books? Get them here! My Daddy Rules the World, by Hope Anita Smith and Daddy Long Legs, by Nadine Brun-Cosme. * These are affiliate links. HEE received review copies of the foregoing titles, but all opinions are our own. It's almost Valentine's Day! As your world turns various shades of posy pink and radiant red, why not celebrate by sharing some heart-filled books with your little ones? Here are our top ten favorite books about love -- the huggy kind, the kissy kind, the self-love kind, and -- my personal favorite -- the love is love is love kind. Enjoy! Worm Loves Worm, by J.J. Austrian, illustrated by Mike Curato: What happens when two worms fall in love and want to get married? Which worm will wear the dress and which will wear the tuxedo? On second thought, if worm loves worm -- why should anything else matter? This fabulous story is without a doubt Happily Ever Elephants' favorite book about love. Love Is, by Diane Adams, illustrated by Claire Keane: A little girl learns what it means to love as she cares for a duckling, hugs him closely, and then learns to let go. A tender beauty. XO, OX: A Love Story, by Adam Rex, illustrated by Scott Campbell: An awkward ox falls in love with a gorgeous (albeit conceited) gazelle, and he takes to writing her one love letter after another. Though his overtures are sharply rebuffed, the ox nevertheless persists and eventually causes the gazelle to have a change of heart. When an Elephant Falls in Love, by Davide Cali, illustrated by Alice Lotti: When an elephant falls in love, he experiences many of the same emotions as the rest of us: he's giddy with joy and weak with anticipation. He's left feeling equal parts shy and bold, and sometimes a little bit foolish too. There's nothing like first love! I Heart You, by Meg Fleming, illustrated by Sarah Jane Wright: A beautiful tribute to the incomparable connection between a parent and child, this is a lyrical and tender exploration of the ways in which a parent's love can both encourage and reassure. A perfect gift for expecting parents! What do You Love About You, by Karen Lechelt: We are all individuals, and as each and every one of us has our own unique attributes, we all have something to celebrate! This book is a perfect reminder that each of us is special in our own way, and it encourages kids to ask themselves "what do I love about me?!" Hug Machine, by Scott Campbell: The title says it all -- no one can resist the hug machine! He's really good at hugging. So good, in fact, that you will be amazed at all the little things we never think to hug but really enjoy a good dose of affection. Pure joy! Hedgehugs, by Steve Wilson, illustrated by Lucy Tapper: Hoarce and Hattie do everything together. Well, almost everything. Hard as they try, the hedgehogs just can't find a way to hug - their sharp spikes always get in the way! The two set off on a mission to figure out how to hug - and it will undoubtedly make your little ones giggle with glee. All Kinds of Kisses, by Heather Swain, illustrated by Steven Henry: How do giraffes kiss? What about hummingbirds? If your little ones love hitting you up for smooches, they will love reading this book with you -- and trying to imitate the animals' actions. Love Monster, by Rachel Bright: Poor googly-eyed love monster just can't find a way to fit in with all the cuddly folks of Cutesville. This causes Love Monster to set out on a journey in search of someone to love him just the way he is. Reminding even the most jaded that love happens when you least expect it, this book is sure to leave you with a smile... and an open heart.